Sorin Stoica was a central figure in Sunday’s match against Orlando. Stoica called 21 fouls against City, to Orlando’s 14. BRONX, NY. – New York City Football Club couldn’t exorcise the demons in the form of their expansion sibling, Orlando City Soccer Club, helmed by none other than ex-boss Jason Kreis. Once more Cyle Larin proved he has some sort of otherworldly powers when facing the Boys in Blue, netting a brace to bring him to nine goals in eight matches against City. The Lions also managed to snap City’s regular-season home unbeaten streak that stretched back to June of 2016. The first of Larin’s goals exposed just how much NYCFC miss first-choice left back Ronald Matarrita (high-ankle sprain) as the assist came in from City’s left, where fellow Costa Rican Rodney Wallace had taken over. A low, pacey pass from an unpressured Scott Sutter ran past Wallace and found a well-covered Larin who poked it in. Wallace performed much better on the second goal (as well as a non-traditional defender covering one of the league’s best strikers – alone – can do), simply getting out-muscled by Larin who got on the end of a cross from Donny Toia to put Orlando up 2-0 in the 51st minute. On City’s side opportunities were plentiful, but a familiar problem reared its ugly head as the Pigeons struggled to finish their chances. Jack Harrison and Ethan White both created good chances from the right side – the best was White’s cross into the box that was just a touch too deep for both David Villa and Tommy McNamara to get a foot on. NYCFC did well to control possession, holding the ball for 62.6% of the match and outshooting their opponents 13-9. A glimmer of hope would shine through in the 74th minute. With Orlando playing a man down due to injury, Maxi Moralez and David Villa combined to cut the Lion’s lead in half. To ask the City faithful, the story of this match was likely the officiating of referee Sorin Stoica. 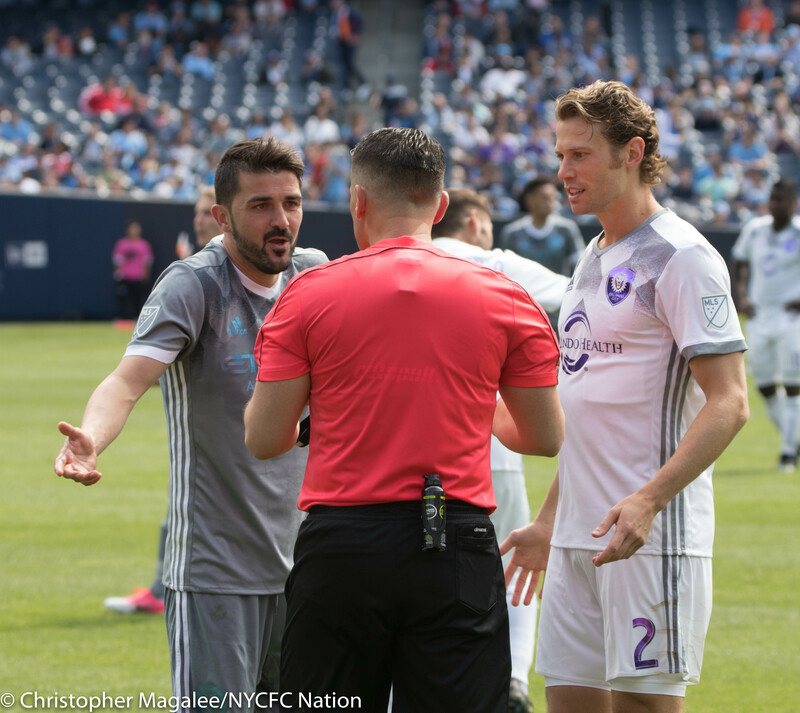 Stoica seemed to only want to call fouls against the home side Sunday afternoon (21 fouls against NYC to Orlando’s 14), but all told each side finished with four yellows (though three of Orlando’s all came in the closing minutes). It can be argued all day that the officiating hampered NYCFC’s attack, but in the end it is on the players to finish their opportunities, and that is something that just wasn’t happening. In his post-match press conference, Patrick Vieira hammered home the idea that NYCFC lost this match not because Orlando is a better team, but because collectively, City did not defend the Lion’s “second ball” well enough – meaning the second ball after Joe Bendik launched the ball to begin his side’s attack. Vieira believed his team was well prepared for Orlando’s style of play, and that in the end they just did not execute well enough. The Boys in Blue have a short road trip next week to take on second place Columbus Crew on Saturday April 29th. Kick-off will be 7:30 EST on YES.